Are you a Belieber? Well apparently Calvin Klein is, or at least they think their target demographic are, as the Canadian pop singer is their latest brand ambassador. This familiar black and white fashion ad campaign has already been mired in photoshop scandal, with Justin Bieber's body made to allegedly look even more muscular and his underwear ads a tad more padded. Who knows what the truth is, either way it's great publicity for the designer clothing brand. These Calvin Klein Jeans billboards with the 20-year-old tattooed pop star cavorting with the lovely model Lara Stone were first spied along West Hollywood's Sunset Strip on January 15 and a second ad creative snapped in the same location on February 24, 2015. If you like these outdoor ads, be sure to check out more Calvin Klein billboards featuring Lara Stone (who just like in these ads is often scantily-clad, all in the name of fashion of course). 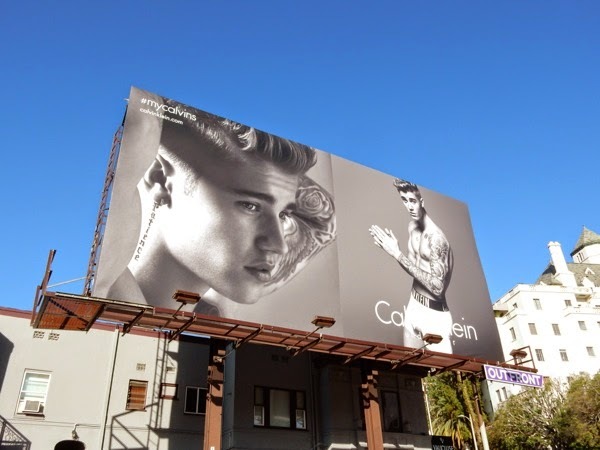 UPDATED: Here's also a Calvin Klein Underwear billboard featuring Justin Bieber solo, spotted in the same Sunset Boulevard location on March 24, 2015. This is one of the images rumored to have been enhanced by photoshop, bigger biceps and padding in the underwear department allegedly. What do you think, truth, haters or PR spin at work? Here's a bit of fun for a Friday. 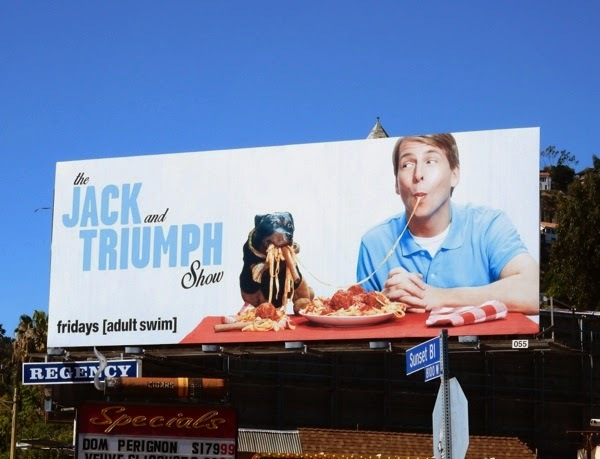 Daily Billboard loves this homage to Disney's 1955 Lady & the Tramp animated movie and the dogs famous spaghetti eating scene, although this version for Adult Swim's The Jack and Triumph Show is much messier and hints at the show's humorous, naughty nature. 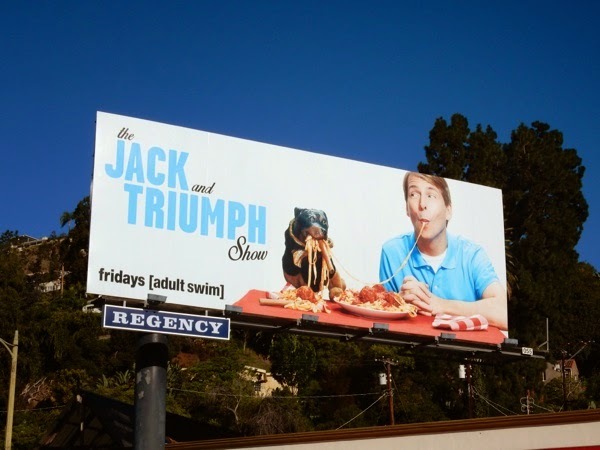 In this new scripted sitcom, 30 Rocks Jack McBrayer stars as 'Jack Malicki', a former child actor of a Lassie-like series from the 1980's and 1990's called 'Triumph's Boy' whose life took a downward spiral after the show's cancellation and when he was led astray by man's best friend. 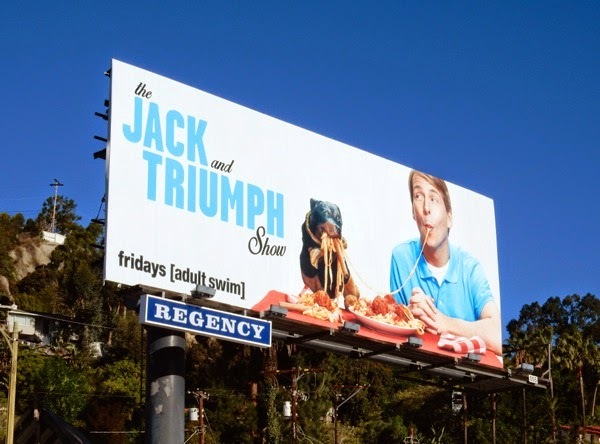 Now 15 years later after rebuilding his life away from show business, he's reunited with his co-star 'Triumph, the Insult Comic Dog', voiced by series co-creator Robert Smigel, and we're sure hilarity will ensue. Joining Jack and the offensive cigar-chomping mutt is also Oscar nominee June Squibb (who plays the former co-star from Triumph's Boy). 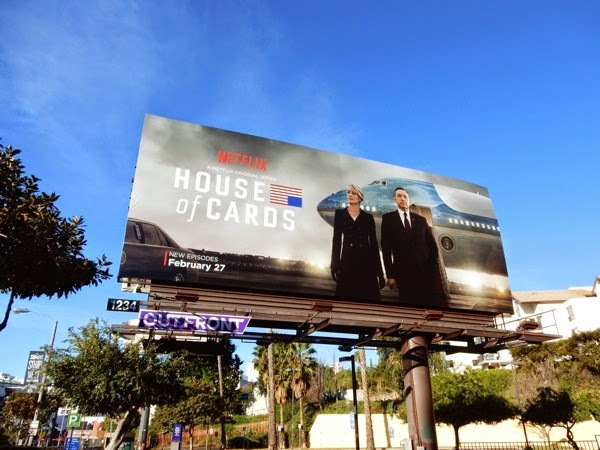 This fun series premiere billboard was snapped along Sunset Boulevard on February 20, 2015 when the show debuted. 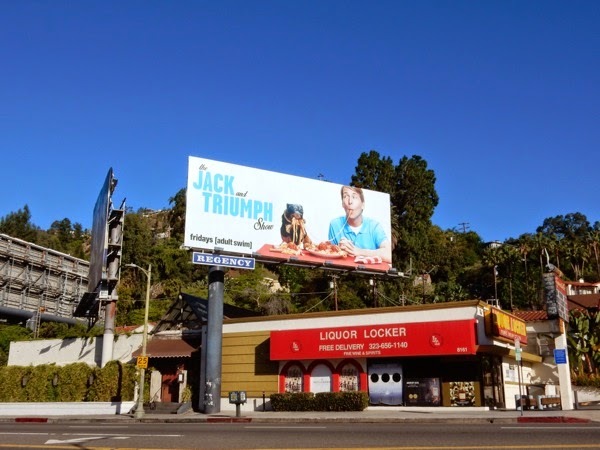 If you're a fan of the actor, be sure to check out this 30 Rock billboard featuring Jack McBrayer as 'Kenneth Parcell'. And if you like this parody creative, be sure to also check out Chelsea Handler's Lion King homage billboard for her Netflix comedy special. 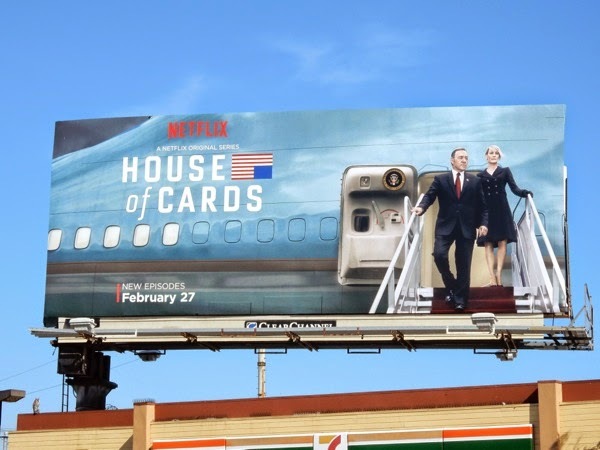 When House of Cards began, did you really think 'Frank' and 'Claire Underwood' would make it to the White House? The journey has been fraught with scheming, backstabbing, murder, sexual dalliances, betrayals and more shocks besides, but you have to agree it's been one hell of a ride. 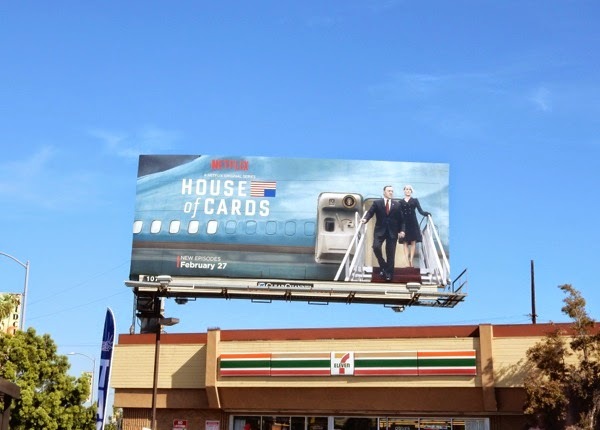 This Air Force One creative for the Machiavellian political drama immediately evokes the Presidential nature of the third season and quite frankly fills Daily Billboard with chills and anticipation for another thrilling season. 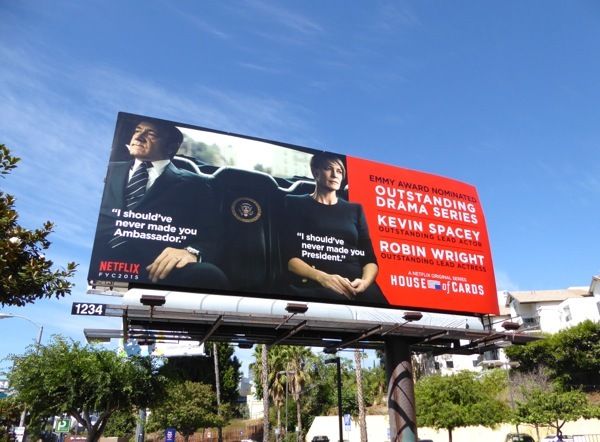 Robin Wright and Kevin Spacey now both deservedly own a Golden Globe Award for their roles as the power couple who truly epitomise the saying, 'the ends justify the means', and we're sure this season will be no different. In a world where real-life politics seem just as nefarious, this darkly comic look at the abuse of power in Washington, D.C. seems more relevant than ever. 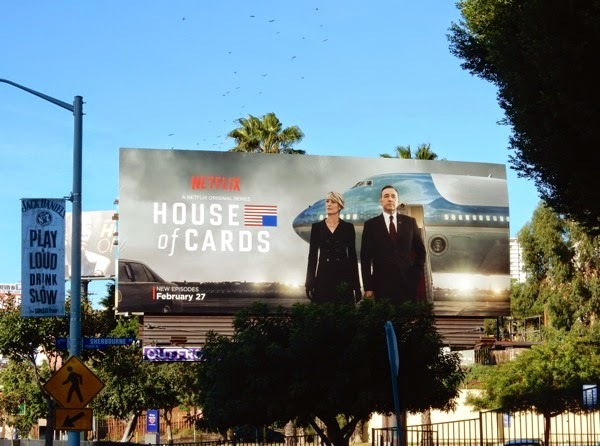 This compelling season three billboard was snapped along West Hollywood's Sunset Strip on February 24, 2015. 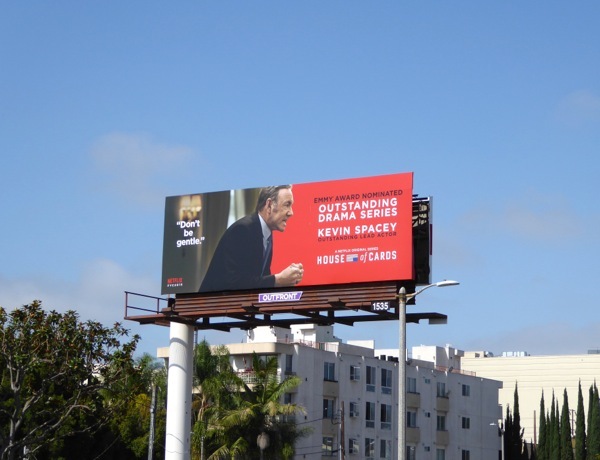 If you're a fan of the binge-worthy show, be sure to check out these House of Cards season one billboards and House of Cards season two billboards. Get ready for another marathon streaming session, but maybe, just maybe, slow down and take time to appreciate every episode as you never know what you'll miss by devouring the whole season too quickly in one go. UPDATED: Here's another fantastic Air Force One creative for the new season, this one with the Underwoods disembarking the Presidential plane. 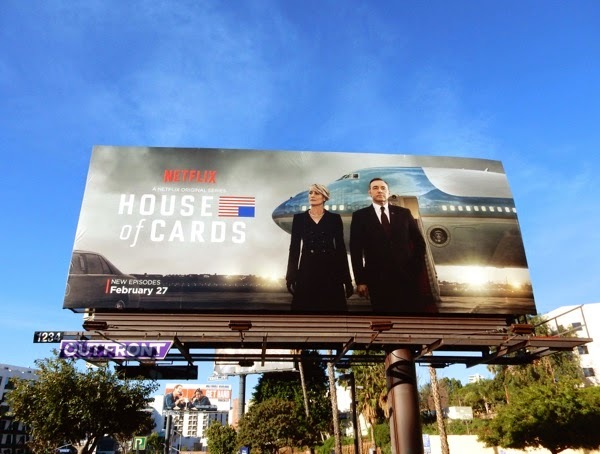 This highly evocative billboard was spied at the intersection of La Brea Avenue and Pico Boulevard on March 4, 2015. UPDATED: It was certainly a dramatic third season for the Underwoods in House of Cards and by the looks of things the TV Academy agreed, with the Netflix show garnering Primetime Emmy nominations in eight categories this year. 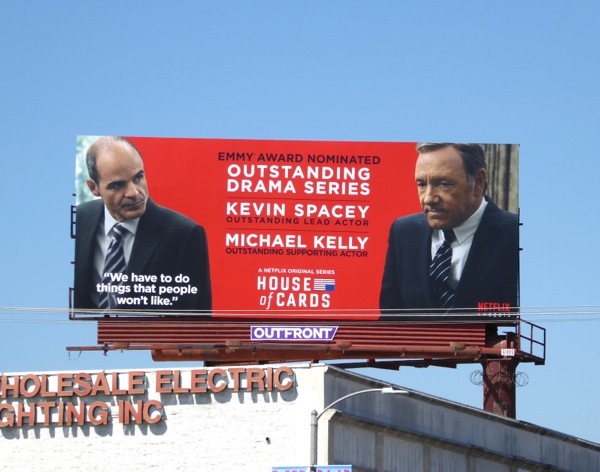 These bold Emmy nomination billboards to help grab voters attention were spied above La Brea Avenue on August 12, 2015 and along the Sunset Strip and Beverly Boulevard a few days later. 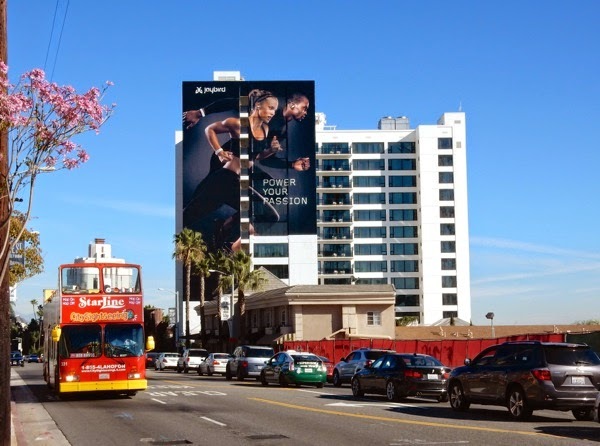 With the 2015 L.A. Marathon just weeks away and some of those New Year's fitness resolutions starting to falter, Daily Billboard thought it would be the perfect time to shine a spotlight on this giant-sized billboard for Jaybird's bluetooth sports headphones, earbuds and activity trackers. 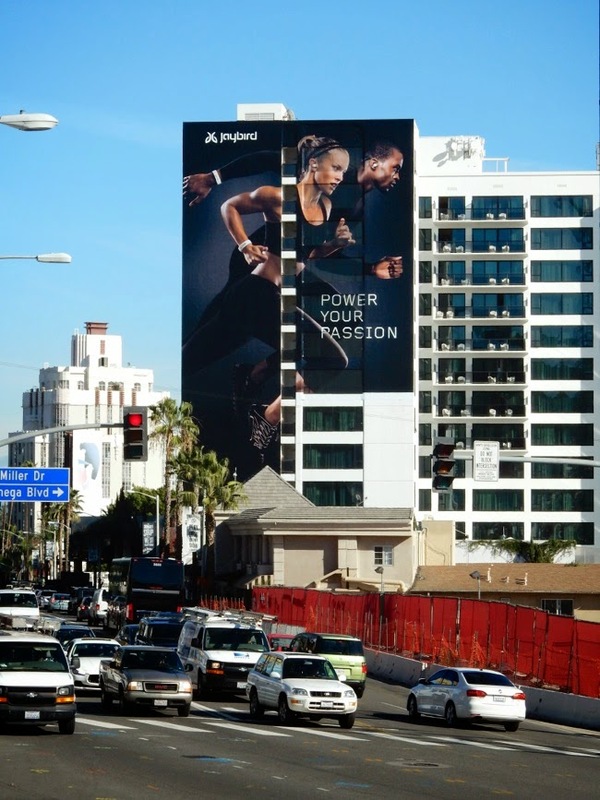 This striking 'Power your passion' ad creative on the side of the Mondrian Hotel along the busy commuter artery of L.A.'s Sunset Strip was captured on January 17, 2015. 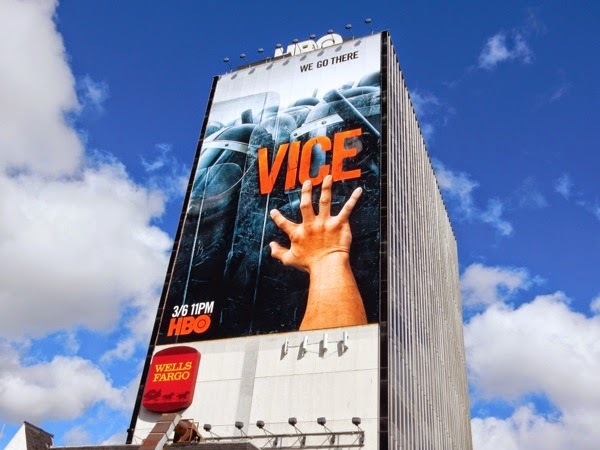 It certainly makes a dramatic impact up close, or from a distance, in fact Daily Billboard feels positively sporty and athletic just looking at it. 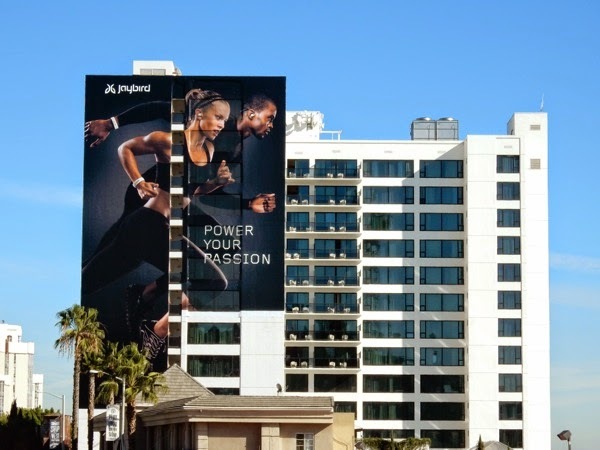 If this super-sized fit couple have inspired you to get up off the sofa, or at least think about it, be sure to also check out these cool L.A. Marathon billboards and GoPro camera extreme sports billboards that have graced L.A.'s skies these past few years. The weather in L.A. has been all over the place these past few weeks, unable to decide between rain, fog or heatwaves, which doesn't make for the best photographic conditions. 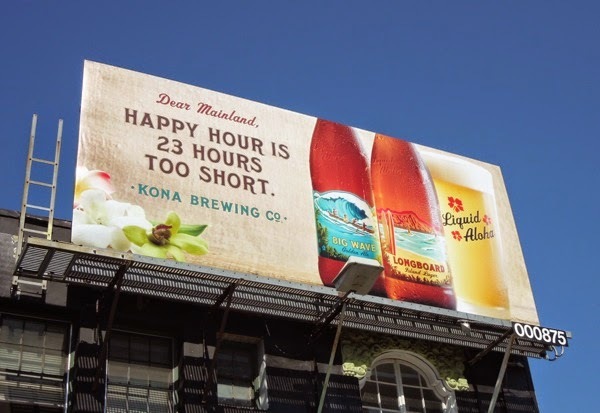 The temperamental weather conditions and that fact that it's a Tuesday, makes Daily Billboard think of getting away from it all and where better than a trip to Hawaii. 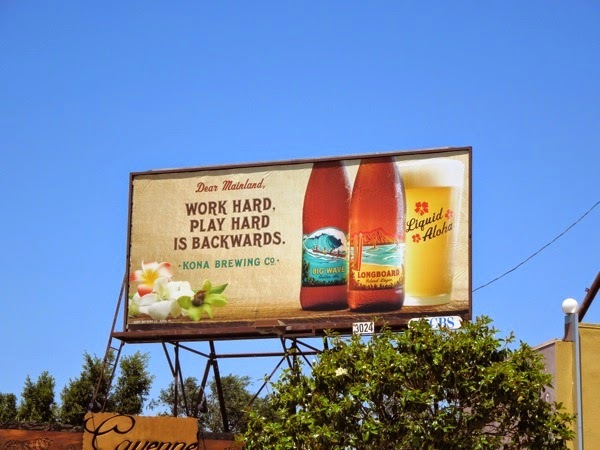 And if you can't get to Hawaii 'Dear Mainland', maybe you can enjoy a piece of America's 50th state right here courtesy of the Kona Brewing Co.
With year round beers like Longboard Island Lager and Big Wave Golden Ale, hopefully you can be transported (at least by your taste buds) to the sun, surf and relaxation of Hawaii. 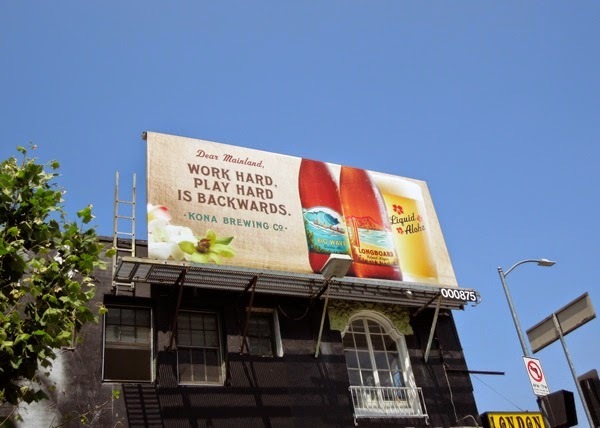 These fun billboards for Kona Brewing Co. snapped along Melrose Avenue and Beverly Boulevard from May to July 2014, certainly evoke the laid back feel of the islands in the Pacific Ocean with their witty 'Work hard, play hard is backwards' and 'Happy hour is 23 hours too short' tag lines. 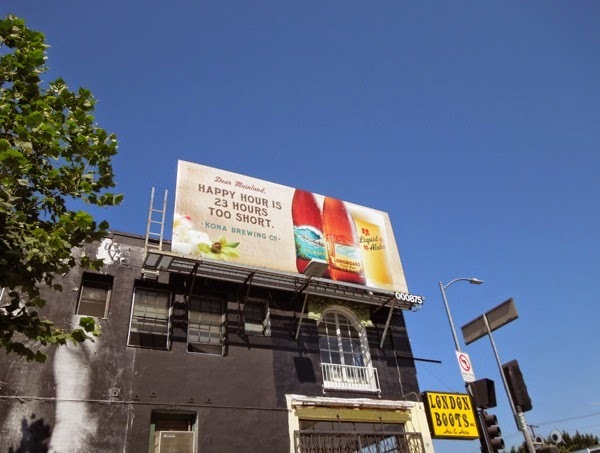 If beer is your drink of choice, be sure to also enjoy these other beer brand billboards (feeling thirsty yet?). 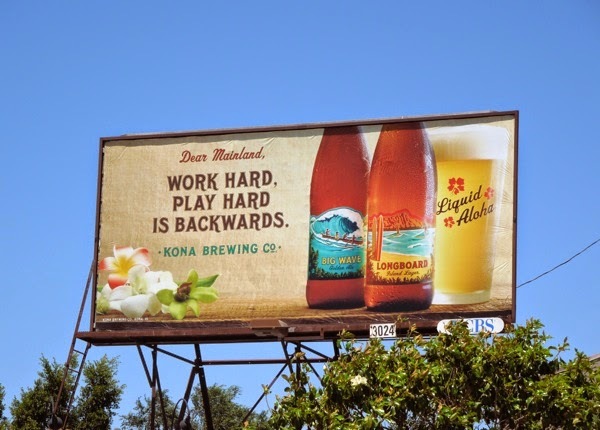 Enjoy some Liquid Aloha today. 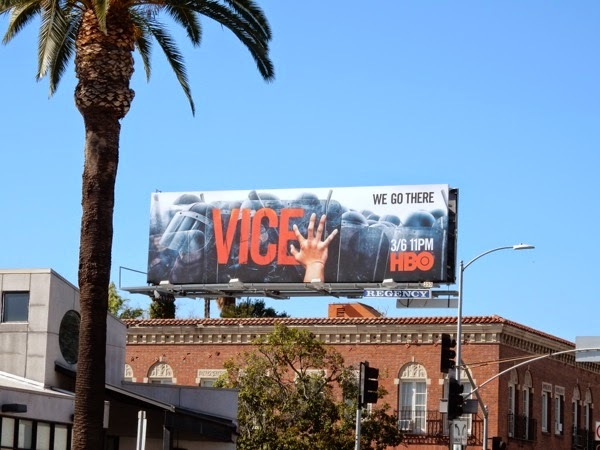 HBO's Vice is back for a third season of going where other intrepid journalists, reporters and documentary makers fear to go. The unorthodox approach of the news magazine series helps them tell groundbreaking stories and uncover the weirdest, scariest and most shocking customs and happenings around the globe. 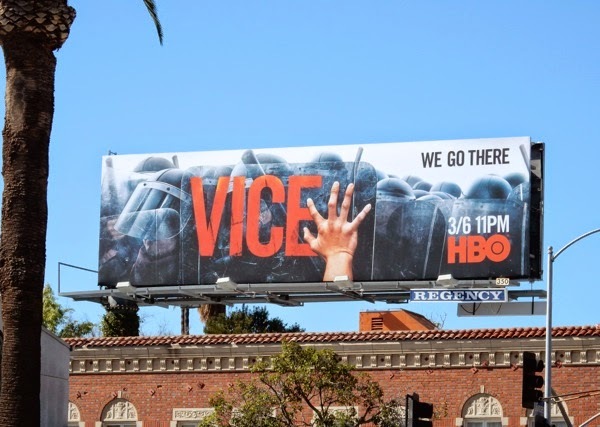 These season three ad creatives with the outstretched hand in front of a horde of police in riot gear really help to convey the idea that Vice is right there on the front lines (either that or they're in some zombie horror movie). 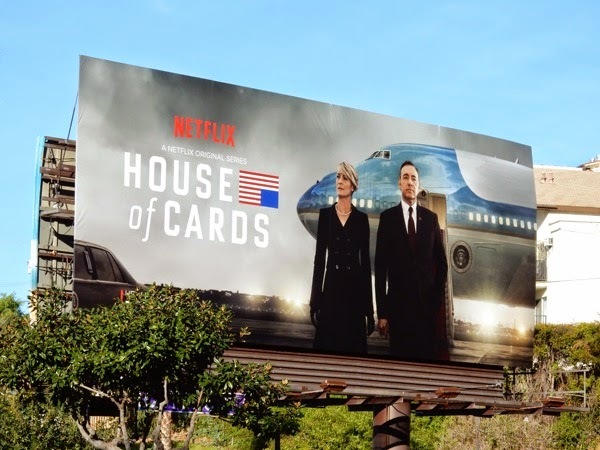 These striking billboards were first spied along Sunset Boulevard on February 10, then snapped later along Melrose Avenue on February 13, 2015. 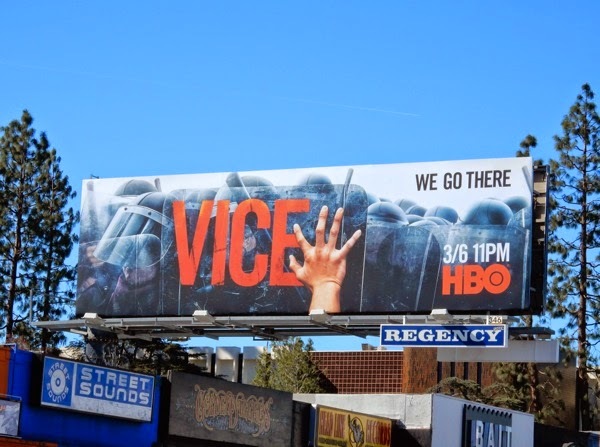 If you're a fan of the series, be sure to also check out these Vice season two billboards and Vice series premiere billboards from years past. They go there, but will you be watching this season? 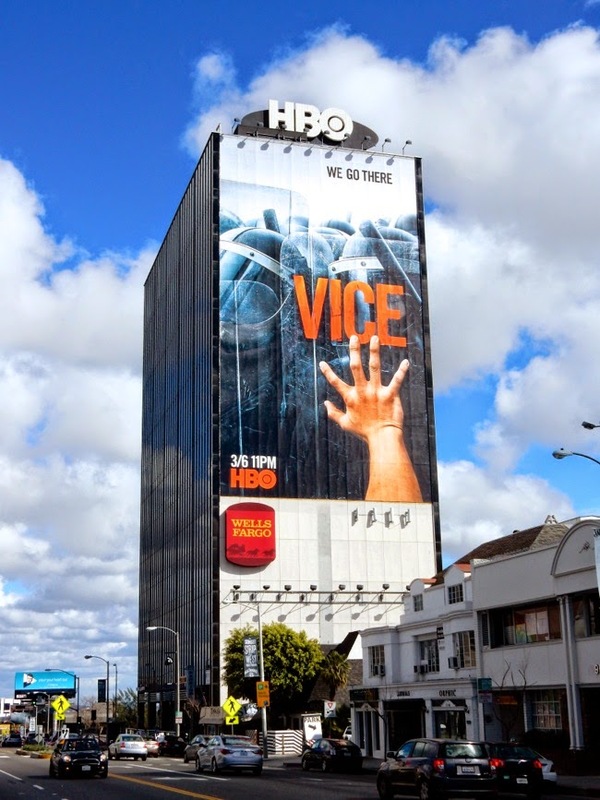 UPDATED: Here's also the evocative ad creative on a super-sized scale, towering over L.A.'s Sunset Strip eastbound on a cloudy February 28, 2015. 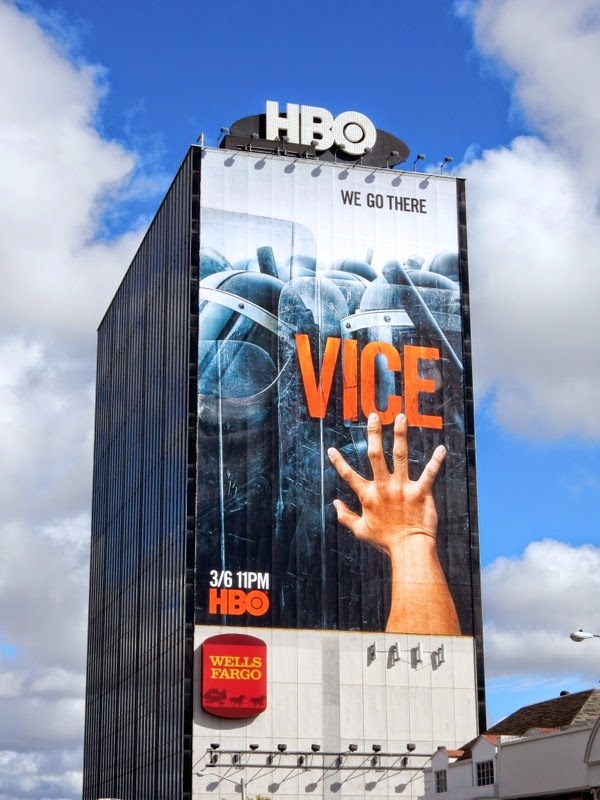 You have to agree this giant billboard for Vice's third season has amazing standout and is impossible to miss. 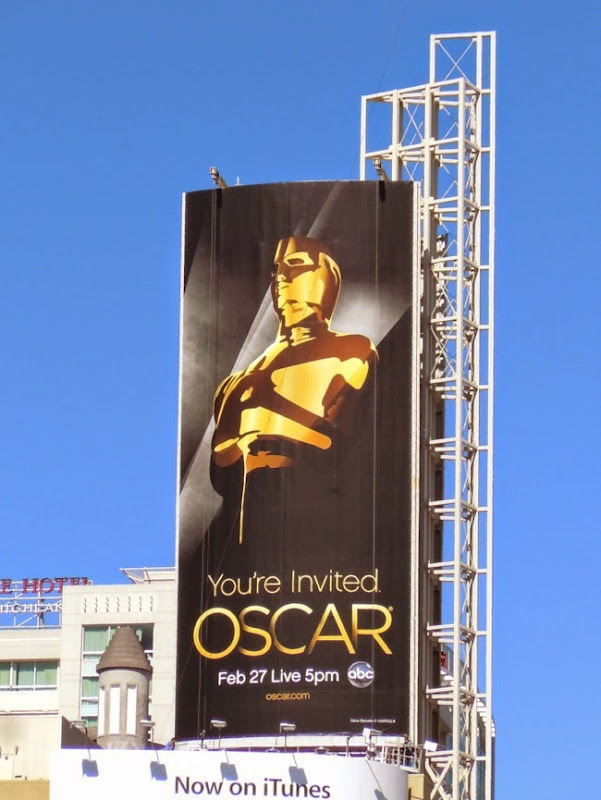 Let's face it, the annual Academy Awards ceremony can be hit or miss affair depending on who's hosting them. This year How I Met Your Mother's Neil Patrick Harris emcees the prestigious awards to end all Hollywood awards and we can probably expect some singing, dancing and maybe a dash of magic on the Oscar stage from someone who has already dazzled at two Emmy and four Tony Award broadcasts. 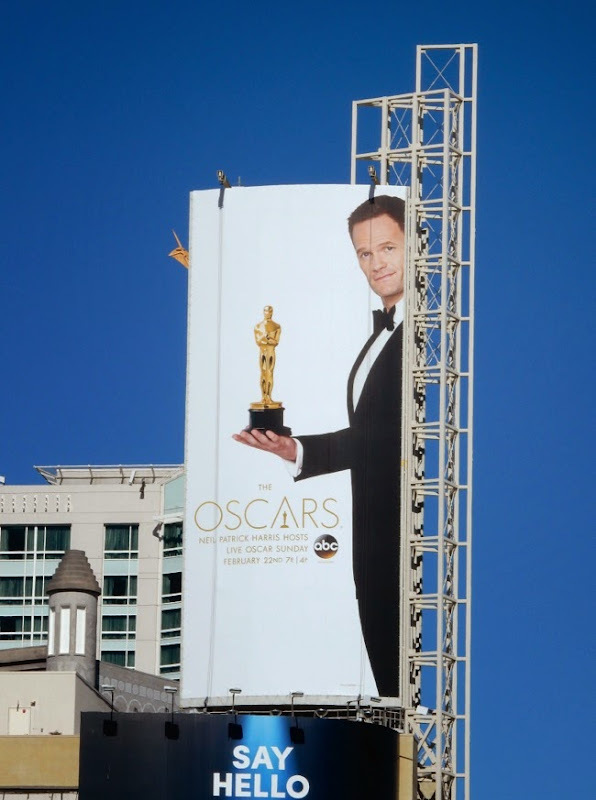 The recent Broadway sensation of Hedwig and the Angry Inch was spied looking dapper with his friend Oscar high over Hollywood & Highland on February 12, 2015, where you'll find The Dolby Theatre that hosts the glittering annual motion picture awards today. 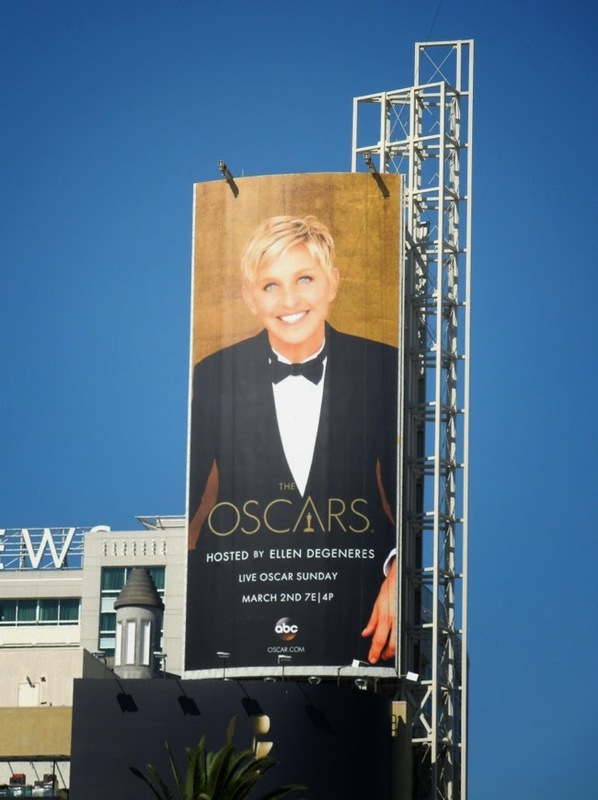 Flashing back to last year and Ellen DeGeneres was on hosting duties and this golden billboard featuring the daytime talk show host was snapped on February 24, 2014. Ellen brought her own unique flavour to the live broadcast twelve months ago and broke the internet when she tweeted her celebrity-filled selfie. Daily Billboard wonders if Neil Patrick Harris will be able to pull something out of his magician's hat equally as memorable this year, but at least there's a pattern forming of the Oscars being hosted by funny and openly gay talent. Hopefully his stint won't be as disastrous as James Franco and Anne Hathaway's painful co-hosting of the 83rd Academy Awards, where the statuette was the star of the billboard (and probably would have done a far better job in front of the camera on the night) and was snapped on February 11, 2011 in the same Hollywood location. 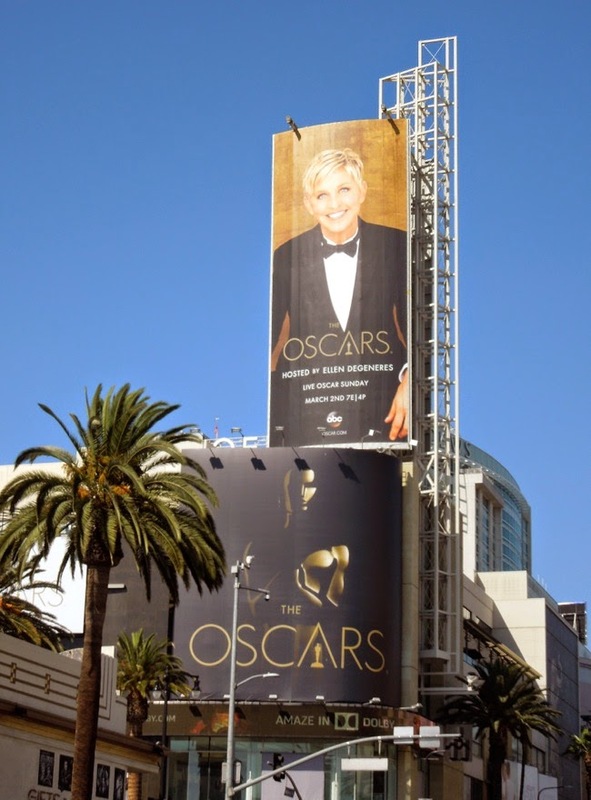 If you like these outdoor ads, be sure to also check out the 82nd Academy Awards billboard featuring that year's hosts Steve Martin and Alec Baldwin from February 22, 2010. 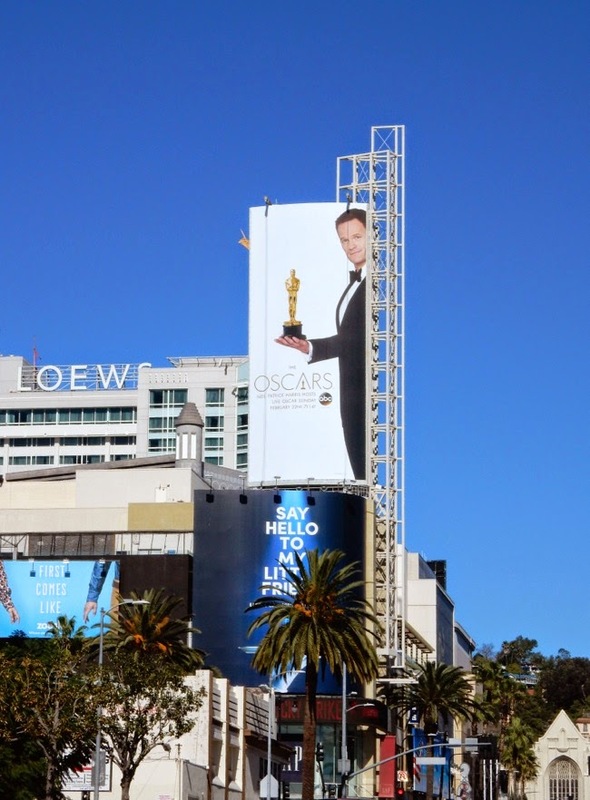 You can also take a look at all the Oscar movie contender billboards filling the skies of L.A. in the run up to this special evening. Break a leg Neil and do Oscar (and David and the kids) proud. 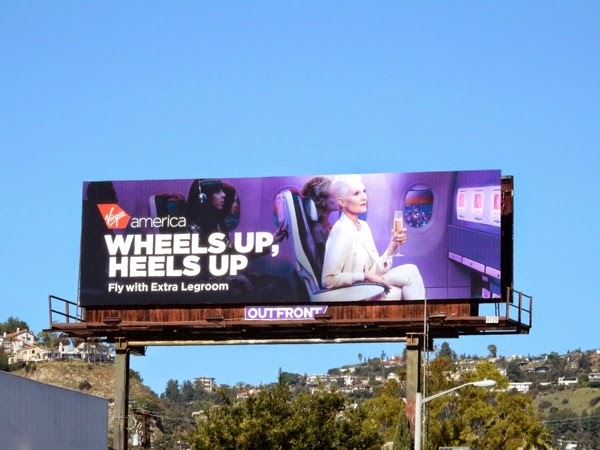 Ever since Virgin America launched its U.S. domestic airline service back in 2007 it really has provided 'a radical departure' from other established airline carriers, and so too has its advertising. 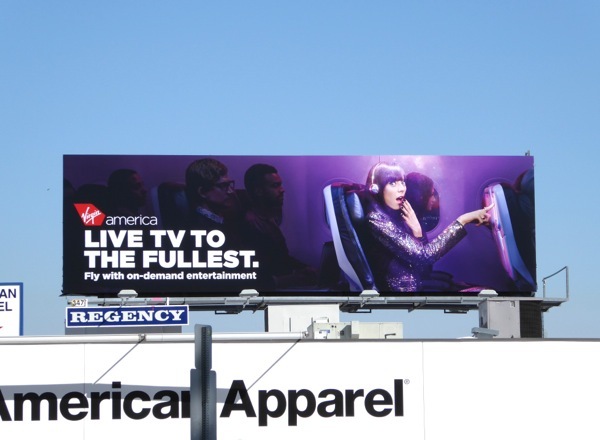 Not only does the U.S. based airline provide a low fare, high quality experience, but your journey also tends to be a lot more fun aboard Virgin America. Of late that concept has been split up and used for a second wave of creatives highlighting the airlines key selling points and differences. The more sophisticated, champagne-drinking 'Wheels up, heels up' creative focuses on extra legroom and was snapped along Fairfax Avenue on February 12, 2015. 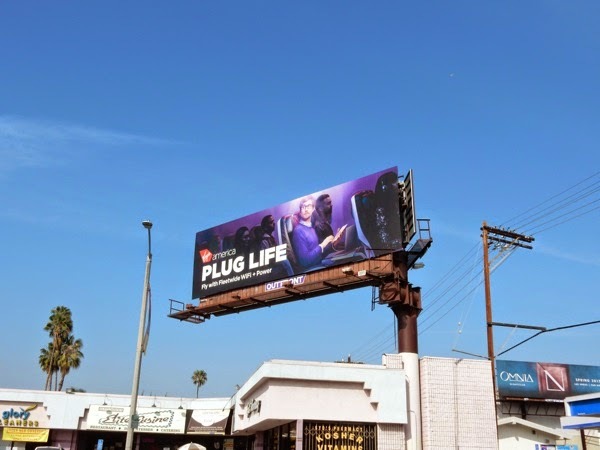 The 'Plug life' billboard was spied along Beverly Boulevard on February 18, 2015 and highlights the fleetwide WiFi and power charging capabilities, perfect for business travelers and those with smartphones and tablet devices. 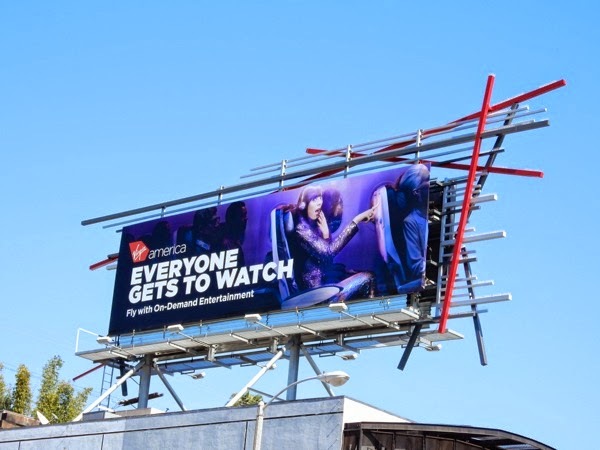 The more youthful, innuendo-laden 'Everyone gets to watch' billboard was snapped above the Sunset Strip on February 15, 2015, and promotes the On-Demand nature of the in-flight entertainment. 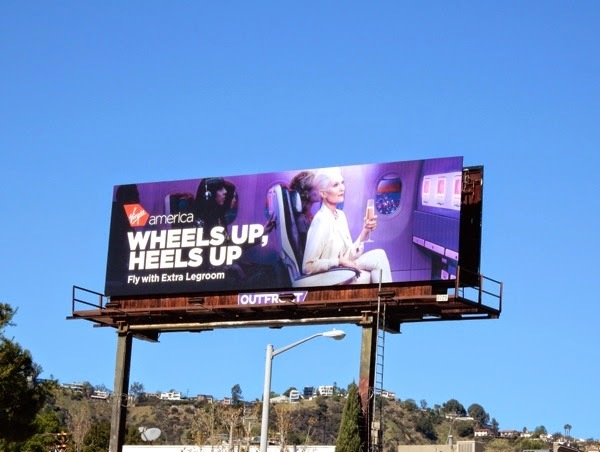 These witty billboards not only fly the corporate colours, but they also embody the fun experiential nature of Virgin America and the fact the airline has a distinct personality. 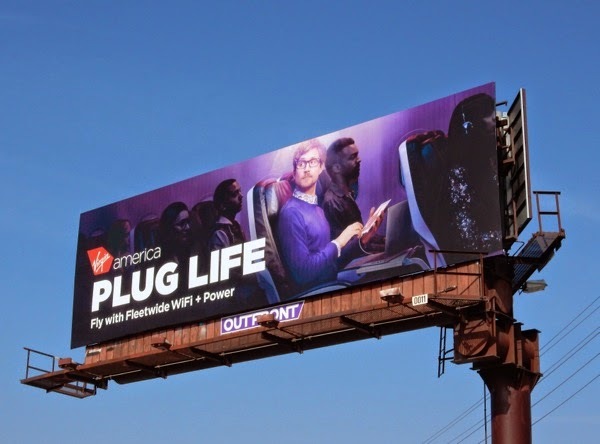 If you like these cool outdoor ads, be sure to check out these previous Virgin America airline billboards from years past, making the skies of L.A. far more entertaining than other bland airline advertising. 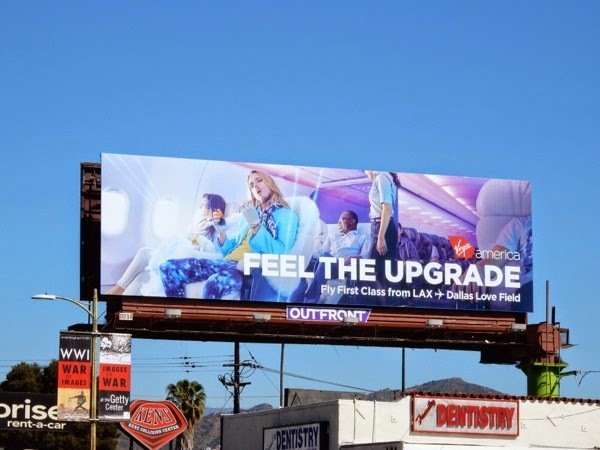 UPDATED: Here's another new Virgin America billboard advertising how you'll 'feel the upgrade' and travel like a rock star by the looks of things. 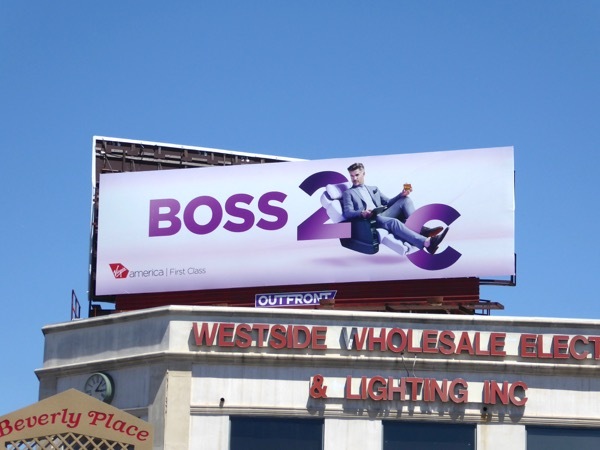 This cool billboard was snapped on march 4, 2015 along L.A.'s Vine Street. 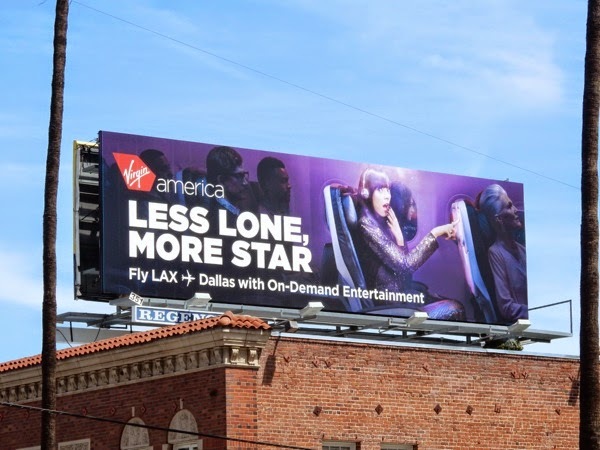 UPDATED: Here's another creative in Virgin America's latest ad campaign snapped along Sunset Boulevard on April 29, 2015, this one tailored for the on-demand entertainment services on their LAX to Dallas flight. 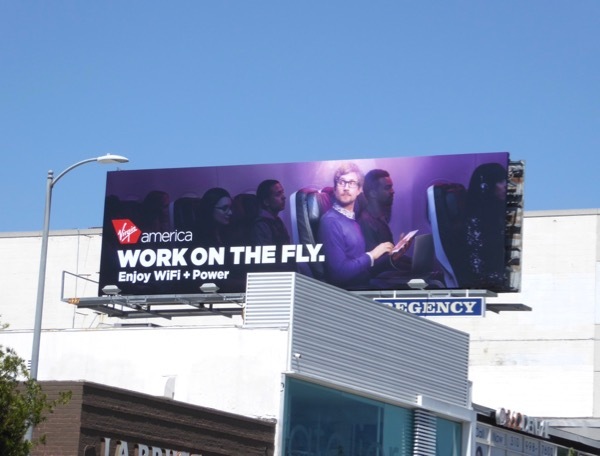 UPDATED: Here's another witty ad in this Virgin America billboard campaign snapped along Highland Avenue on February 8, 2016. 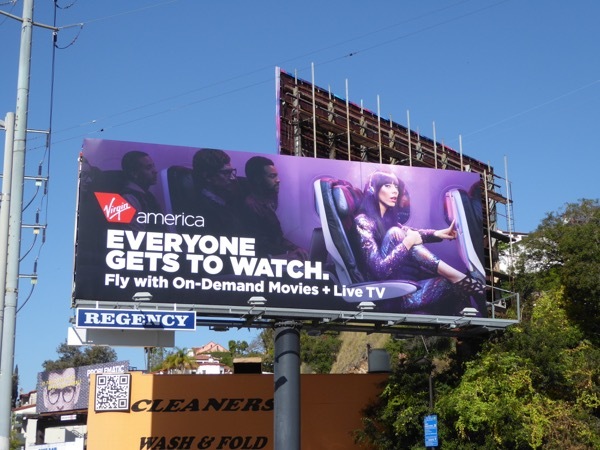 Plus another iteration focusing on the airline's in-flight TV offering, spotted along Melrose Avenue on February 19, 2016. 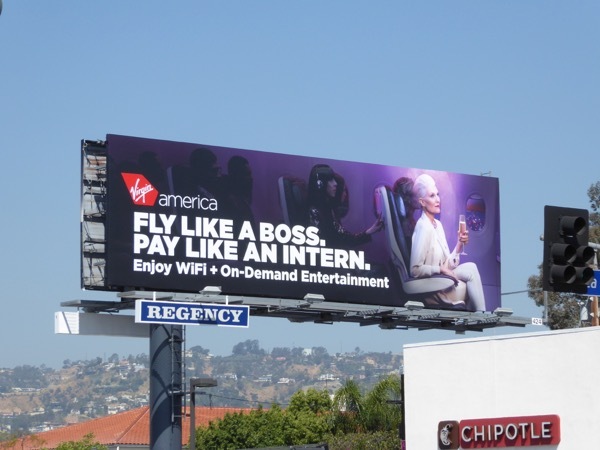 UPDATED: Here's also an interesting look at how Virgin America advertise their First Class service. 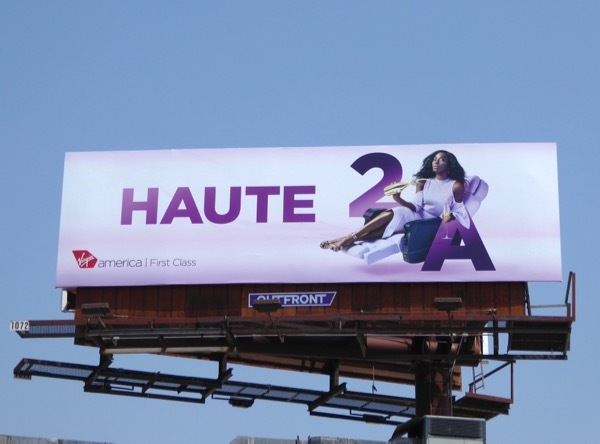 The 'Haute' ad creative was spied along Westwood Boulevard on June 25, whilst the 'Boss' billboard was spotted above Beverly Boulevard on July 20, 2016. It's clever how they've incorporated the plane's seat numbers in the design of the ads. 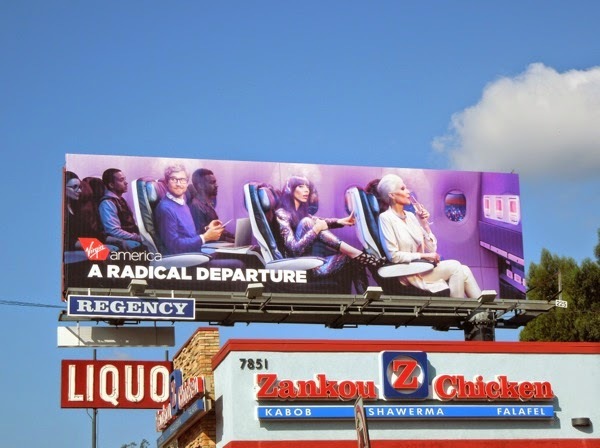 UPDATED: Alaska Airlines may have announced that it plans to retire the Virgin America brand by 2019 after acquiring it, but that doesn't mean the airline can't make the most of its existing ad campaigns by refreshing the billboards with some witty new copy. 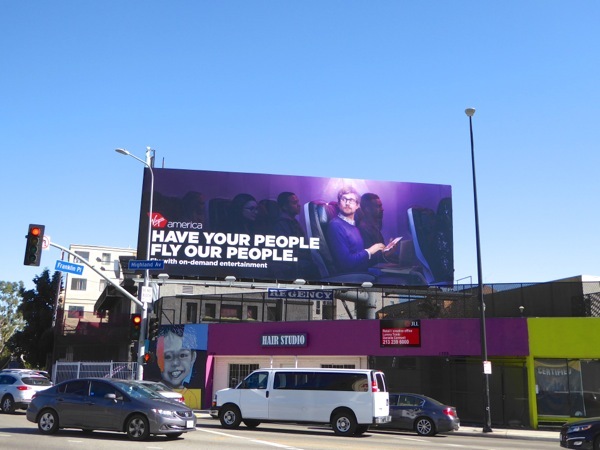 These revamped billboards were photographed along Melrose Avenue and the Sunset Strip from April 12 to April 19, 2017. 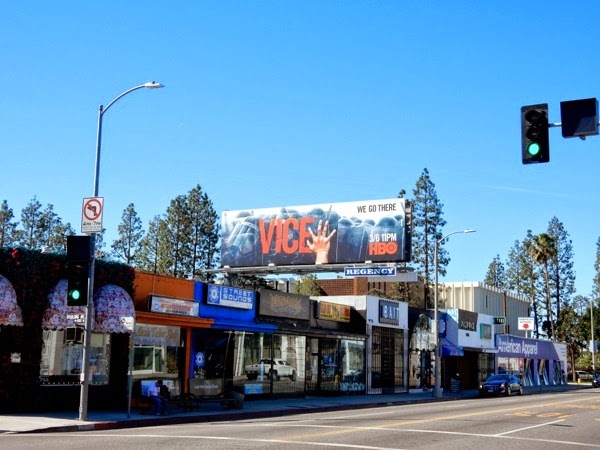 And this additional reworked billboard snapped along Westwood Boulevard on April 29, 2017.